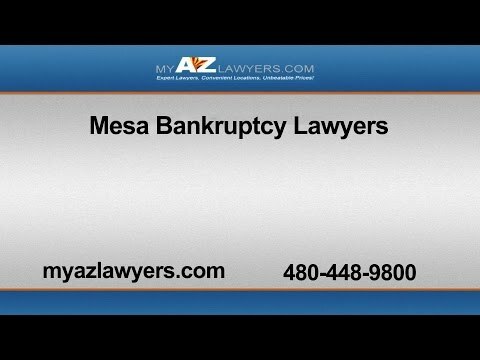 If you wish to file for bankruptcy in Mesa Arizona, it is important to learn everything about the process. Most people have never heard of a 341 meeting of creditors. Let’s take a look at the bankruptcy process, how a 341 meeting of creditors works, and how it all can affect how you or your bankruptcy lawyer handle your case. In Mesa, there are many different kinds of bankruptcy. Bankruptcy as a definition is a legal process that a business or individual may file for if they cannot pay their large sum of debts. Usually a bankruptcy case will only be considered if assets and income are far below the ability to pay off the debts. A Mesa bankruptcy lawyer will often be able to help a person file for bankruptcy by meticulously going over their assets and income reports for the filing to check for errors. Errors on a bankruptcy file could lead to trouble, such as a fraud charge. If the court decides that a person or business qualifies for bankruptcy, their debts will be essentially wiped clean, although their credit will be affected by the bankruptcy for ten years or more. For Chapter 7 bankruptcy, a bankruptcy trustee will be chosen from a panel to handle the case. The trustees job is to maximize the value of assets that creditors are seeking. They also are appointed to investigate evidence of fraud or transfer issues. A trustee could be thought of the ‘prosecutor’ and your bankruptcy lawyer as the ‘defense attorney’. A 341 meeting of creditors is a way for the trustee to ask the person filing for bankruptcy questions, under oath, about documents they proved for the case and other issues within the case. Are you going to soon receive any money by an inheritance? Do you hold any personal injury claims? Do you owe any child support or spousal maintenance? Are there any creditors present here today? Have you read the documents filed for your bankruptcy case? Did you sign your bankruptcy documents? Do you solemnly swear or affirm to tell the truth, the whole truth and nothing but the truth? Have you read all the bankruptcy information provided to you? How long have you lived in the state of Arizona? Have you previously filed for bankruptcy, specifically in the last eight years? Did you list all of your creditors in these documents? Is the information listed in your documents accurate? Did you list all your assets in these documents? After the questions are finished, the trustee will ask questions that cater to the individual case at hand. Creditors, if they actually show up, are allowed to ask questions as well. Should you file for bankruptcy and attend a 341 meeting of creditors, you should have your bankruptcy attorney present with you as well. This will ensure that all questions are answered properly and accurately. After all questions have been asked and any issues with the bankruptcy filing have been assessed, the meeting is over. A 341 meeting of creditors may seem a little useless, but it serves as a way to be fair to creditors that will be negatively impacted by the bankruptcy filing. I need help with my bankruptcy case. If you need a bankruptcy lawyer with the knowledge, experience, and expertise in bankruptcy law to help you file for bankruptcy in Mesa, look no further than My AZ Lawyers. Our team of talented attorneys handle bankruptcy cases, DUI charges, criminal defense, and divorce law. When you need to make sure your bankruptcy case is handled properly, you should always look for a law firm like My AZ Lawyers that has a good track record of successful bankruptcy cases and happy clients under their belt. Give us a call today for a consultation of your case and to see if we can match you with a great lawyer.